Looking for a gift that oozes decadence? 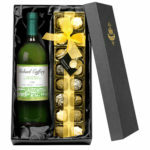 This set of luxury truffles and personalised wine is sure to hit the mark. Beautifully smooth and rich chocolate truffles are perfectly paired with this quality white wine. 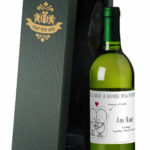 The deep chocolate perfectly compliments notes within the wine, which is a choice of crisp and dry Sauvignon Blanc or French Sauvignon Blanc Semillon. The label of this beautiful bottle is adorned with the recipient’s name and a message from you, making this a first-class gift they won’t soon forget!